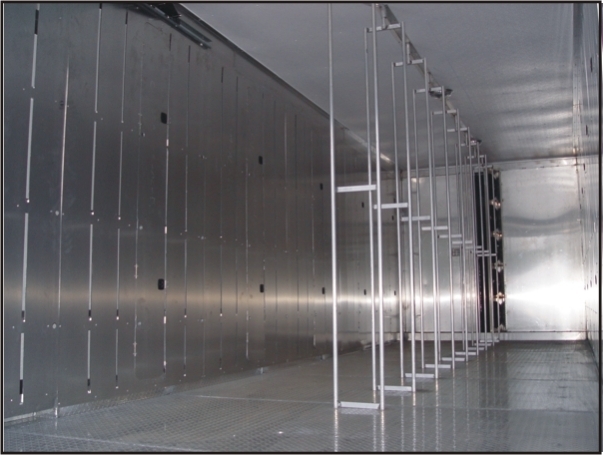 ..The STURDY advantage...our exclusive horizontal air flow system. The diagram above demonstrates the air flow path through the chicks, ensuring fresh air and oxygen evenly throughout the trailer or straight truck. The air passes into the body through the front scoop, into the front compartment where it is directed into the cab through the centre inlet fans. These fans direct the air down the center of the main compartment where it passes throught the birds and is exhausted out the side of the vehicle. The "Dash Panel" controls the system either through manual control or completely automatic control. "AUTO" mode will run and maintain the systems based on pre-determined target temperatures set by the hatchery. This system is 12 volt, and powered predominantly through a high capacity alternator. The alternator used are the same alternators used in the construction of fire trucks, ensuring their reliability. As a backup, an additional bank of deep cycle backup batteries are provided, which can offer up to four hours of operation without connection to any tractor.